On Wednesday, April 14th, pink lights went on to welcome the visitors to the 4th Nippon Connection Film Festival. From 14th - 18th April 2004, the Nippon Connection Film Festival offered a unique location to see, listen to and taste Japanese Culture in different locations around Frankfurt. In its wild mixture of brand-new feature films and digital productions from Japan with lectures, parties, exhibitions, performances and workshops the festival is truly exceptional. 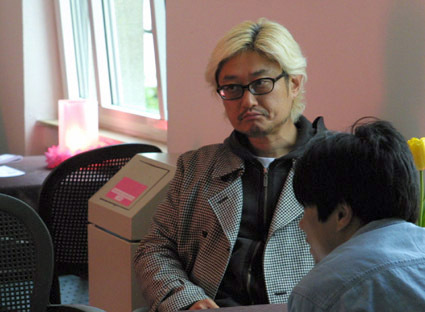 The more than 200 films presented a cross-section of contemporary Japanese film and many of them are shown as German, European and International premieres. Taking place in Frankfurt am Main/Germany on an annual basis it draws an audience of more than 15.000 people. The festival is organized on a non-profit basis and the guy taking your ticket and the girl you buy your beer from are all working on as volunteers. The broad spectrum of events, the size and the non-profit organization make Nippon Connection unique throughout Europe and the largest Festival of its kind. As soon as the festival opened its doors, hundreds of people started lining up to get a ticket for the opening film: Takeshi Kitano's latest movie Zatoichi. 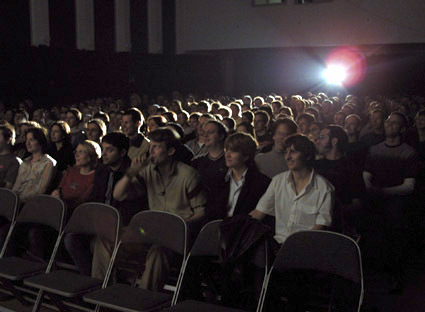 Before Zatoichi started the festival direction welcomed the more than thirty Japanese guests, who had travelled to Frankfurt am Main/Germany to present their films. Star-director Yukihiko Tsutsumi, whose films 2LDK, Jam Films and Love Collage were shown in the "Nippon Cinema" program, and producer Kunihiko Tomioka, were interviewed on stage and as a special surprise one short movie of the "Exchanging Tracks Project" was shown before people settled in their seats to watch Zatoichi. Copyright ý 1997-2004 SHIFT(JAPAN). All Rights Reserved. Comments and Suggestions: shift@jp.org.